YOU WILL FALL IN LOVE WITH THIS MARVELOUS BRACELET! The inner bracelet circumference measures approximately 5-5/8", plus a 1-1/4" opening, and 1" at widest point. Bracelet weighs 70 grams. 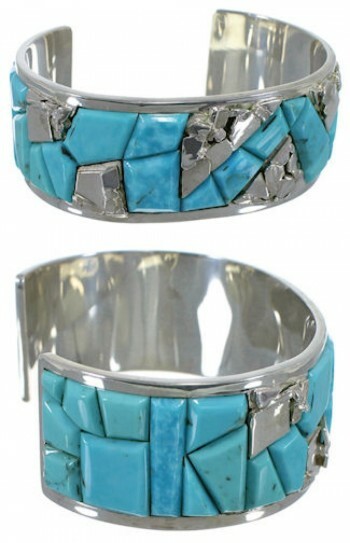 The beautiful features in this cuff bracelet will make you appreciate Southwestern art! This bracelet is a stunning piece of jewelry that is hand crafted out of genuine sterling silver and real Turquoise inlay. The inlay is carefully set while gorgeous silverwork can be seen accenting for an amazing look. The bracelet is stamped sterling and hallmarked.